Raise your hand if you have fully packed yourself with unnecessary calories over the holidays! Great, so that makes pretty much all of us. Including me! I have a confession to make. I have eaten more cookies than I can count during these past 6 months. As I know how much I enjoy my life and the time spent with loved ones during the holidays, I can´t judge you and would rather say it’s perfectly fine to overeat during those times. In the end it is very important to know how and when to stop, and how to get back on track once the holidays are over. Don’t wait for Monday, start today with detoxification. It’s very important to eat less sweets and carbs during these next few days. Morning smoothies should be your best friend from now on. 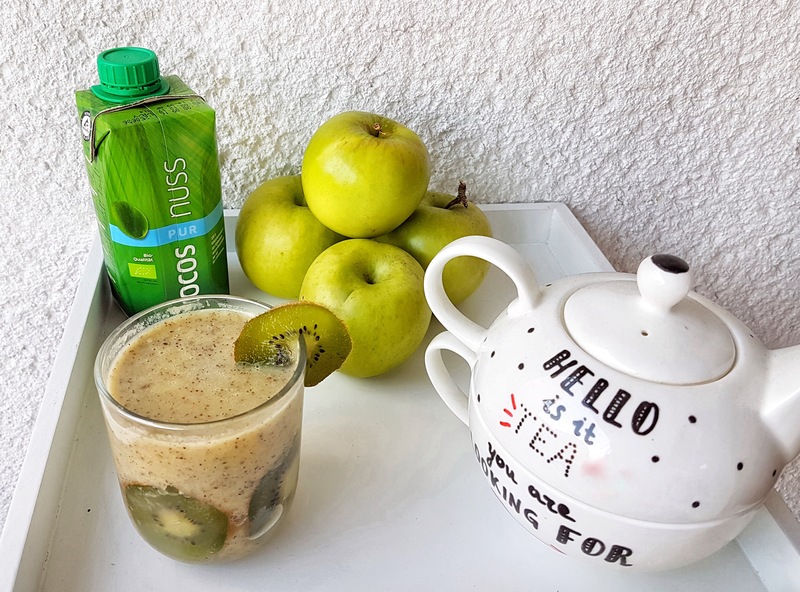 That’s why, this morning, I’ve been enjoying this Coconut-Kiwi-Green Apple Smoothie with Chia Seeds. 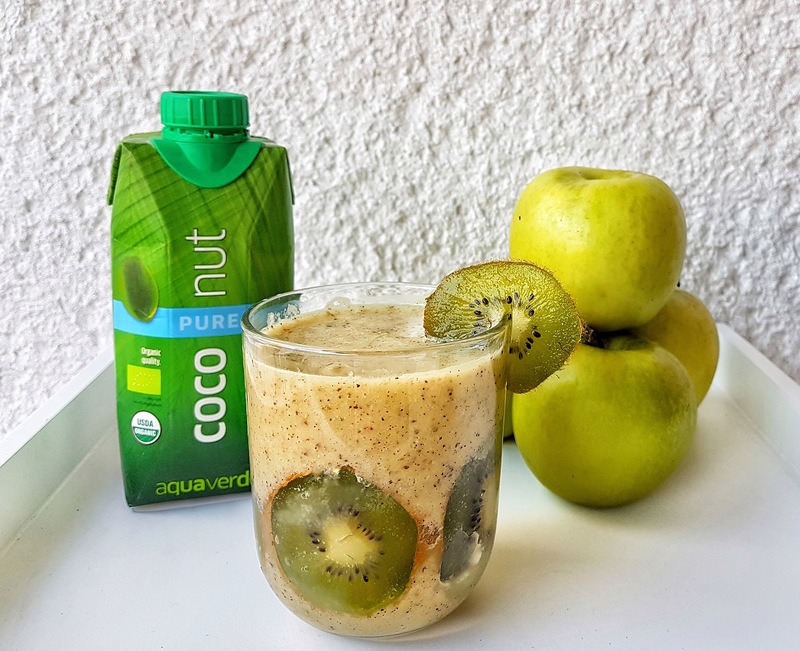 It’s packed full with healthy nutrients from wholesome ingredients like kiwi, green apple, chia seeds, banana and coconut water. There’s also a kick of protein from peanut butter, which makes this smoothie taste amazing. It is like a taste of the tropics with every sip. Did you know that coconut water is so good for you? Maybe you did, but I’m sure you didn’t know how exciting it becomes when you add a little kiwi? Well, it’s great. So there you go. Also, did you know that green apples are a beautifying, low-sugar fruit? They contain fiber, which moderates blood sugar levels and promotes good digestion, as well as vitamin C and potassium. Let´s not forget to give a little attention to the goddess called ¨Kiwi¨! These little friends are packed with more vitamin C than an equivalent amount of orange. They contain numerous vitamins and minerals that boost your health. Because they contain plenty of fiber, they can reduce high cholesterol levels, which may reduce the risk of heart disease and heart attack. Hopefully you have now already gotten my point which is that the combination of these three is a key to a Beauty Detox lifestyle. Place all the ingredients in a blender and blend until super smooth. Enjoy! Fit For The Winter Holidays – Dubai Edition !